Happy 2014.. We are back with first hacking story of the year - SKYPE "Stop Spying". Yes Skype Got hacked last night by an infamous hacker group called the Syrian Electronic Army, a group that supports Syria’s president and typically they publish pro-Syrian government messages, but its first time they are taking about PRIVACY. Syrian Hackers posted some messages on Skype’s Twitter account i.e. "Stop Spying on People! via Syrian Electronic Army,"
Next tweet reads, "Don't use Microsoft emails (hotmail, outlook), They are monitoring your accounts and selling it to the governments." Syrian Electronic Army hackers also compromised Skype’s Facebook page and a company blog hosted on Skype’s website. 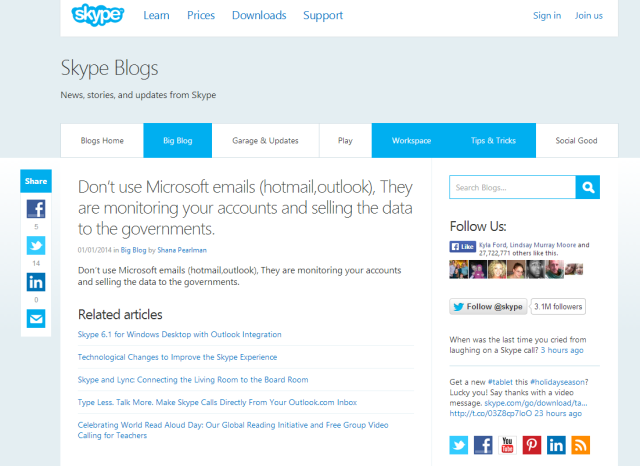 A blog post published on the official Skype blog featured the headline, "Hacked by Syrian Electronic Army.. Stop Spying! ", which now has been deleted by Microsoft. Now it appeared that Skype regained the access to their accounts and deleted all fake messages posted by hackers, "You may have noticed our social media properties were targeted today. No user info was compromised. We're sorry for the inconvenience." statement from Skype. "No user information was compromised." The Syrian Electronic Army's latest attack appears to be linked to documents released by Edward Snowden, which revealed the PRISM surveillance program. NSA reportedly can see data about online conversations from other Internet behemoths too, including Verizon, AT&T, Google and Facebook, and Skype and Microsoft have been cooperating with the government. It appears that the Syrian Electronic Army won’t be stopping this year as well and more high-profile companies are now part of their target list.